If you weren’t here over the weekend, make sure to check out Saturday’s awesome guest comic! Also check out this amazing hand-made wooden Biff rocket puzzle by the fantastic Mr Chris Yates! The details are at his puzzle site! This one-of-a-kind puzzle will go on sale later today to the first person that clicks the buy button! I’m already jealous of the future person that gets to own this gorgeous piece of art! Today’s Maximumble reaches for the sky. …That is an awesome puzzle. Literally. It inspires awe. Pools are superior to ocean, at least in New England. Either the water is too cold or the sand is too hot. There are barely any waves to speak of here. I’d rather chill by the pool where I can do dives and swim laps and not step on seaweed or jellyfish. Grug: But not yellow pools. I find it amusing that this comic contains no yellow pools, giants, or even any visual signs of giants, such as an enormous tower. 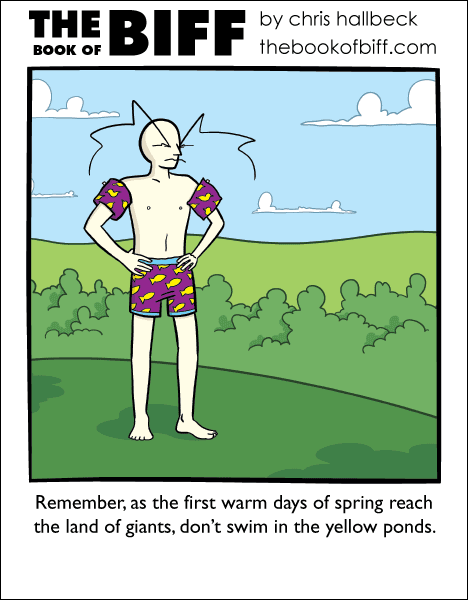 And if you do get caught in the yellow pond make sure you have your goggles.